While You Were Sleeping is a one-man stand up comedy show incorporating physics, chemistry, pharmacology, anaesthesia and Ikea furniture. It gives an insight into one anaesthetist's account of counting backwards from ten and going into a deep deep deep sleep... Michael Toon invites you to share this journey with him over one hour of mind blowing comedy. Michael Toon is an Olympian, Pharmacist, Anaesthetics Doctor, Labrador owner and Open heart surgery survivor. He has been performing stand-up comedy since 2013 in Brisbane, the Gold Coast, Melbourne and Sydney and was a Raw Comedy Queensland finalist in 2016. 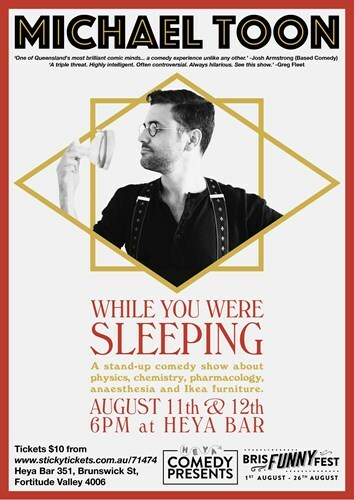 While You Were Sleeping is his first solo comedy show and draws on his experience in pharmacy, toxicology and anaesthesia both administering and receiving.